The Foreign Office has told Britons that the situation is still "volatile"
Nearly 1,700 military personnel have been sacked and 130 media outlets shut down as the crackdown continues following the failed coup. A key aide to the US-based Muslim cleric blamed by Turkey for a failed military coup has been captured by Turkish forces, a presidency official has said. President Recep Tayyip Erdogan has blamed Fethullah Gulen for the unsuccessful bid to overthrow the government, which Gulen has denied. Halis Hanci, described as Gulen's "right-hand man", reportedly entered Turkey two days before the coup attempt began, the official said. It comes just hours after his nephew Muhammed Sait Gulen was detained in Erzurum in northeastern Turkey. Read: Who is the 75-year-old blamed for Turkey's deadly coup? Turkish authorities have detained a nephew of Fethullah Gulen, a US-based Muslim cleric accused of organising the failed military coup last week, according to state run media. Gulen, who denies any involvement in the coup, has lived in self-imposed exile in the US since 1999 but has an extensive network of followers in Turkey and elsewhere. His nephew Muhammed Sait Gulen was detained in Erzurum in northeastern Turkey, and will be taken to Ankara, the capital, for questioning. Among possible charges that may be brought against him is membership of a terrorist organisation, state news agency Andalou reported. The dispatch comes after President Erdogan called on US to hand over cleric Fethullah Gulen, who he blames for Turkey's failed coup. Turkey has been warned of the consequences of imposing the death penalty as punishment to those involved in the failed coup attempt. Flights are to resume between Turkey and the United States following last week's attempted coup in the country. 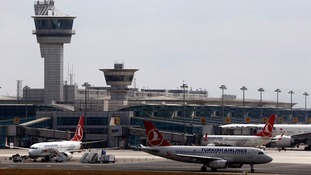 Following the failed overthrowing of the Turkish government, the US Federal Aviation Administration (FAA) prohibited all airlines from flying between the two countries on Saturday. But on Monday the FAA said it had lifted restrictions on all flights to and from Turkey. Turkey's former Air Force chief Akin Ozturk has confessed to plotting the attempted coup which took place on Friday, according to state-run news agency Anadolu Agency. The agency reported that Ozturk, who was being interrogated, confessed to having a role in the attempt to topple the Government. However, private Turkish broadcaster Haberturk said he had not confessed and had told prosecutors he had tried to prevent the coup. More than 200 people were killed after a faction of the military launched the coup attempt, sealing off a bridge across the Bosphorus, trying to capture Istanbul's main airport and sending tanks to parliament in Ankara. Turkey's finance ministry has suspended about 1,500 employees over suspected links to Fethullah Gulen, the US-based Muslim cleric who Ankara accuses of being behind the failed coup, according to a ministry official. The official said the suspensions were in all departments and across the country. Earlier on Monday Turkey repeated its call for the US, its NATO ally, to extradite Gulen, who lives in self-imposed exile in Pennsylvania. Gulen denies claims his network was behind the coup attempt. Angela Merkel has warned Turkey's president that the reintroduction of the death would be incompatible with Turkey's goal of EU membership. The German chancellor told Recep Tayyip Erdogan reintroducing the death penalty was "in no way compatible" with his country's plans to join the EU, a spokeswoman for the chancellor said. The comments come as Mr Erdogan contemplates capital punishment for those behind the failed coup attempt in Turkey. Turkey abolished capital punishment in 2004, allowing it to open EU accession talks the following year, but the negotiations have made little progress since then. America's ambassador to Turkey has said it will consider any extradition request if it meets US legal requirements. 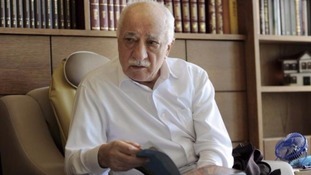 Turkey has criticised the US for asking for proof that US-based cleric Fethullah Gulen was involved in Friday's attempted coup before it extradites him. But US ambassador John Bass said his country was willing to help Turkey investigate the coup attempt, rejecting any suggestion America was trying to undermine Turkish security. He said it was "categorically untrue" that the US had backed the coup attempt.